I love this new line! The main print is my favorite - so whimsical and cute! Pick just one?? Ha! The pear tree bundle in blush is just gorgeous... I could eat it up!! Julie has such an amazing selection. I really love the colors in Power Pop. Thanks for hosting such a generous giveaway. I seriously love this bundle!!! Yup, you nailed it! Woodlands is what I *WANT/NEED**** sooooo bead right now :) I drool over it every day :) Thanks for the giveaway! This new line is adorable! As to Julie's shop, well I'm in love with just about everything in it. But I really, really love Little Apples - Round Round in... well... in just about any color. :) Thanks for the great giveaway! I really like the LARK in Ocean. I'm always attracted to blues and greens! Thanks for the give away! Love your blog! No such thing as favorites, though I do love how they have started bundling Echo with solids. I would love a stack of that! So many pretty fabrics! I love Pear Tree - Fat Quarter Bundle in Azure. Thanks for the giveaway! I love Delighted by Riley Blake.. The red floral Main to be specific. My fave is Power Pop Radio City in Cornflower! I love the Echo bundle in cool colors! Well, Woodlands would be my first pick, but Echo - Half Yard Bundle needs to find its way under my tree this Christmas. But really, who am I kidding, I would love pretty much anything in the store! Well if I have to pick one and really I want to pick them all it would be "Delighted - Fat Quarter Bundle in Red / Yellow by The Quilted Fish". Thanks for the giveaway! I love the Power Pop line. My favorite item is the outfoxed FQ Bundle in Sly. The Flora lattice prints are so cool! Also love the crosshatch patterns in Echo. I love the Echo warm tones that she has put together. So cute! I love the Echo by Lotta Jansdotter!! Especially the Florine in grey! I will be getting that for some throw pillow for my bed!! Thanks!! it would be a toss up between echo and pear tree! Oh, Amy Butler's Gypsy in Cobalt caught my eye. Love the whole Lark collection! Power Pop - Clique in Aqua by Jenean Morrison 1/2 yd Fabric Quilt Cotton is super fun. I love Little Apples. Thanks for the giveaway! How can I pick just one (or ten)? I love them all! cause if I was shopping today this is what I would buy. I was just at their Etsy shop earlier today - I love love love the bundles of Echo they put together! The solids are SO perfect with them! Thanks for the giveaway! Delighted - Fat Quarter Bundle of 21 Complete Collection by The Quilted Fish for Riley Blake Cotton Quilt Fabric is one of my favs right now, but I love the new Woodlands and how exciting it would be to win! Love the Power Pop bundle! partridge tree by thomas knauer.... LOVE IT! It is hard to pick just one!! But I really like the Flora - Half Yard Bundle. I love the coziness of the colors! Thanks! Loving the 'Flora - Paisley Flower in Leaf'!! Easy! I love the Echo fabric line! Don't need to look far! I'm loving that ECHO! I love the new ECHO line - especially the ones that remind me of Queen Anns Lace. I love the Rendezvous range, thanks for a lovely giveaway. i'm excited for the Pez prints. thanks for the giveaway! I love the Flora - Half Yard Bundle in Turquoise! ps - I love the little acorns in Woodlands, too! I seriously love the Woodland bundle and also love some of the Moda Floral Feathers fabrics especially the Leaf color , just gorgeous.Thanks for the chance to win. It has to be Echo. Love it! I sew love bunting/flags right now so Id pick Delighted - Bunting / Flag Panel by The Quilted Fish for Riley Blake :-) Thank You!!! There are so many collections to choose from at Julie's store that it is hard to make a choice, but my favourite is Flora, followed by Delighted. Can't decide between the two. Thanks for a great giveaway. Definitely all that yummy Echo!! This woodland collection looks great! Thanks for the giveaway. I would love to purchase the etchings line! She has amazing sale items! I love the Outfoxed bundle in purple! I am in love with Pear Tree in Azure. Fabulous color and prints! I fell in love with the Woodlands fabrics. All the wonderful gifts I could make are playing in my head! I love everything there...and own much of it...just ask Julie ok now to pick...let's see...I think I will go with Power Pop. I haven't gotten around to buying that one yet. I love the trees from The Woodlands. So cute!! I love the new Echo line, especially Florine in Grey. I don't know if I could choose just one. I really like the Woodlands fabric, as well as Power Pop. Thanks for the chance to win! I love the Little Apples cllection from Moda that the Intrepid Thread has in her shop :) Thanks for the chance to enter! I love the half-yard Delighted bundle in red and yellow! Julie always puts together the best bundles! My favorite thing is the delighted rolie polies. (I just bought two from julie!). Her shop is great and I'd encourage everyone to shop from her, super fast shipping, great packaging! I love Riley Blake's half yard bundle in warm tones. The combination of black and yellow is gorgeous. Oooo that was tricky in fact I couldn't decide on one fabric so I went for this "Flora - Half Yard Bundle Entire Collection by Lauren and Jessi Jung for Moda Cotton Quilt Fabric". Ha I don't have a fabric habit do I? I just love the Happiness - Half Yard Bundle Entire Collection!! It is so gorgeous!! It's hard to narrow down my favorites to less than a dozen or so, but one of the things on my list is the Power Pop Fat Quarter Bundle. Gorgeous! I love The Intrepid Thread! My favs at the present time are Echo, Pear Tree & Happiness. It's impossible for me to narrow it down to just one! I'm loving her new echo bundles with the solids right now. Thank you for the giveaway! This is way different from the fabrics I usually use but I am really drawn to this piece! Lark Heirloom in Blue sky. I'm loving - Pear Tree - Fat Quarter Bundle in Blush by Thomas Knauer for Andover Cotton Quilt Fabric. The pink collection fits me fine. 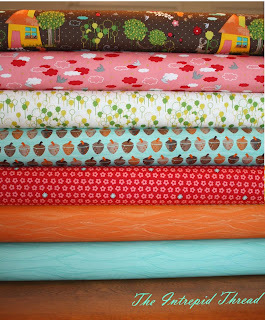 I think that my favorite would have to be the Pear Tree - Fat Quarter Bundle in Blush. I have alot of things in my Intrepid Thread etsy basket. But I think my favorite is the fat quarter bundle of Meet the Gang in pink. So cute. I've been a fan of the actual art so I was super excited to her about her line. I really like the Paisley flower in Tangerine. Thanks. I love Echo and my favourite fabric from the line is Mini Florine in Grey - yummy! Thank you for pointing me over in that direction. Love Woodlands! I think I would choose the Happiness half yard bundle in the blue/green clorway as my favorite from Intrepid Thread. There are so many beauties! I do love the Damasks and "Outfoxed" but I have to say I think my favorite is the Woodlands as you have chosen. Thanks for the chance to win something great! There are so many lovely fabrics at Intrepid Thread right now it is really hard to choose ONE! Okay, I pick this one - today. Lark - Souvenir in Persimmon by Amy Butler. I love Lark. Colours are so pretty! Thank you for the generous giveaway. this beautiful Rendezvous- Queensgate in Tears is the most beautiful thing i've ever seen. i want a DRESS out of that! amazing. From her current selections (I have loved many past ones too) my favorite is Rendezvous. Thanks for the chance to win! My current favourite is Outfoxed - Fat Quarter Bundle in Furtive by Lizzy House but I love Lark too! I love, love the Flora bundle in turquoise, so beautiful. Thank you. 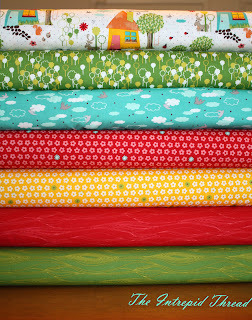 Julie has a Delighted~Fat Quarter Bundle in Green/Pink that's is one of my favorites she's put together. It's a beautiful bundle. This is awesome fabric. I love the bold colors. I love the Flora Half-Yard Bundle in sunshine - a bit of summer in winter! Pear Tree bundle in sweet pea is my absolute favorite! AH! I'm swooning. I'm over the moon for Outfoxed! I love the whole line, and can't wait until Christmas for a lovely package from my aunt to arrive with the fat quarter bundles, haha! Hard to say...but I guess Little Apples Round Robin in red. She sure does have some beautiful fabric! The Woodlands in Chocolate. Love the retro modern feel. Pear Tree - Half Yard Bundle in Blush by Thomas Knauer for Andover Cotton Quilt Fabric -love this one and would make so many nice things. I am totally in love with Outfoxed in Plum by Lizzy House. My couch is soon to acquire some new cushions I think! Wow! I love the Flora - Half Yard Bundle in Turquoise by Lauren and Jessi Jung for Moda. Outstanding selections! I just love the new echo fabrics. So much so that I can't even pick just one. What do I not love over there?! If I have to narrow it down, it's Pear Tree, so fabulous! Thanks for the giveaway! sigh ... the blue colorway of 'Pear Tree' - the Half Yard Bundle! the green color way is on it's way to me, but i really need the blue, too! Julie has the best fabric... and the best prices ANYWHERE! 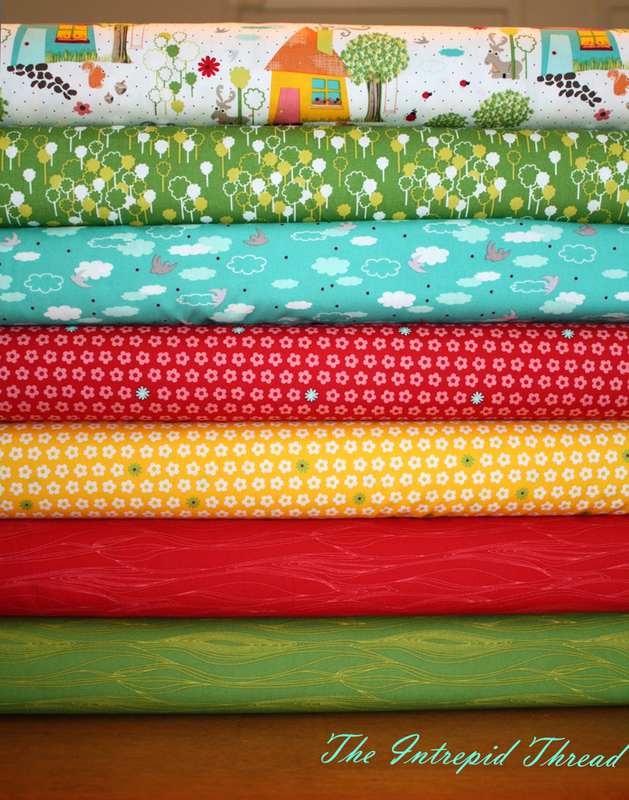 I am lusting after the new Echo fabrics, and loving that she is bundling them with coordinating solids. Thanks for the chance to win! I love the Flora line! I'm thinking of making a floral quilt in pastels, and these fit perfectly! So many gorgeous fabrics! Love the peeps! I really love the pear tree! I always loved the Little Apples line. now I'm tied with Woodlands! then , then ,then .... I don't think I can pick :( I love them all! i love the new echo line - but the woodland is fabulous too! i love the echo fat quarter bundle, yum! Jewel sent me. I really love these fabrics. I have been dying for some outfoxed in sly fox! .....and it fell inot my basket and is on it's way home to me in the Uk - along with a couple of other options... That was an expensive blog hop!!! I adore The Intrepid Thread. She has great prices and tons of inventory. Two days ago I would have answered Flora by the Jungs, but Echo just arrived and I am droolin' over it now. Too many options, Julie!! My favorite over at Intrepid Thread is Flora - Fat Quarter Bundle in Turquoise by Lauren and Jessi Jung for Moda Cotton Quilt Fabric. Thanks for the opportunity to enter your great giveaway! I just ordered Pear Tree fabric from the Intrepid Thread. Love the colors. it is really hard to decide.. Thanks for the chance to win, have a nice weekend! I can't help but wish for some Pezzy Print Magic Beans By American Jane. Way too many fabrics to pick from, but if I can only tell you my favorite - that would be Little Apples - Round Round in Olive by Aneela Hoey. I like the 1/2 bundles. Thanks for chance to win such beautiful fabric and Happy Thanksgiving. I am completely in love with this bundle of Echo in all my favourite colours! I love the Echo collection. I would love to win The Woodlands bundle. Thanks for the giveaway. I like the Echo - Florine in Goldenrod. Tough to choose a favorite- everything at Intrepid Thread is great! But I do love Outfoxed in the purple colorway- so fun! Delighted looks great to me. Hard to choose, but the reds and greys are beautiful. Thank you for the giveaway. Today, I am loving the Echo Florine in Espresso and Goldenrod:) Beautiful:) Thanks for the chance to win some fabulous Woodlands!!! Echo - Florine in Goldenrod by Lotta Jansdotter is one that I saw somewhere and really liked it. I'm really loving the Echo line right now. Thanks for the giveaway. Well I'm thinking Woodlands may be my new most favorite - especially the Half Yard Bundle Light. thanks to you & the Intrepid Thread for the chance to win some! The acorns print (and every other print!) in The Woodlands is my favorite. Thanks for the giveaway! I think the Woodlands would make a great quilt for a child, but I also love the bold prints in Echo! This was a no brainer for me...HAPPINESS is the one for me. Thanks for asking! And for hosting the giveaway! I like your blog. I like Woodlands, Out Foxed and Pear Tree. Thanks for the chance to win!! I like Intrepid Thread's line called Outfoxed. i looove the echo half yard bundle! So hard to choose, but I like Echo. Thanks to you and Julie for the chance to win. I would like a half yard bundle of the Echo and Happiness lines, but mostly Echo. I love the Delighted Pink Floral!! Holy cow, she has SO much stuff! The "Meet the Gang" bundles are very cute! I like the fat quarter bundle of Delighted. I'm also liking the giveaway fabric, The Woodlands. Lots of fun. Thanks for a chance to win. Fairytale Friends. oh so cute. Loving this bundle as I have a thing for Hedgehogs. Thanks for the great giveaway. The fabrics look so pretty. That's what I need for my girl's dress. Would love to make a baby quilt out of that pear tree blush. I am totally smitten by Echo. As soon as Julie posted on Facebook that it was in the shop I promptly bought some (as in last night). Thanks for the giveaway. I'd love to get my hands on some Woodlands too. Winning some may be the only way because I dropped a bundle on the Echo. LOL! Oh my, little houses, trees and acorns! How adorable! Pear Tree. Echo. Woodland. Outfoxed. Pear Tree. Echo. Woodland. Outfoxed. Uhmmmmm, Pear Tree today. 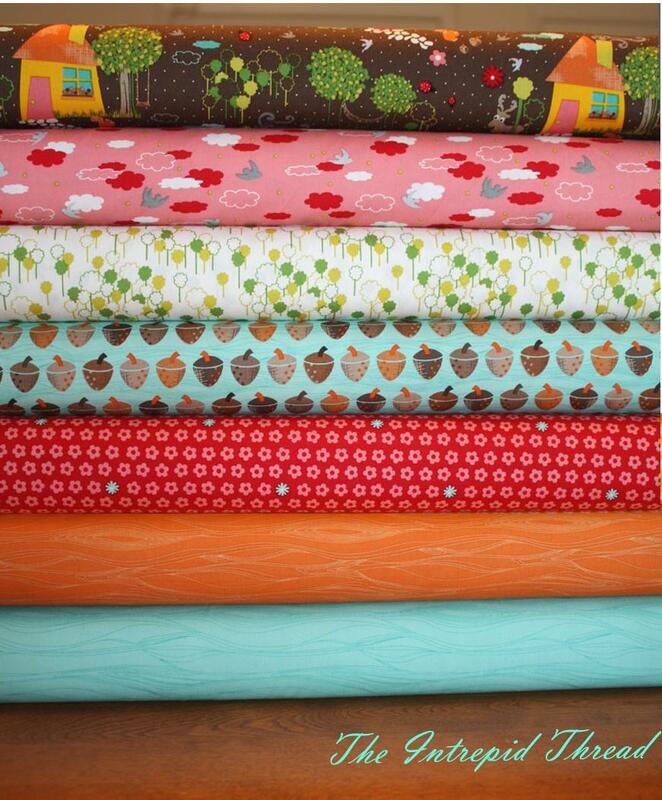 So much to like, so hard to choose...the Happiness half-yard bundle is to die for! I wasn't quite sure if I was supposed to pick a particular fabric in the Woodlands line or just any line. I did love Pop Flowers in Red in the Woodlands line but I was captured by Pear Line, too. The Woodlands are gorgeous, I love love love the acorns! !